Murray Rock Solid™ Main breaker loadcenter is rated at 120/240-Volt AC or 208Y/120-Volt AC and 400-Amps. Interrupt current rating of this 42-space loadcenter is 10-Kilo-Amps. This 3-Phase loadcenter has copper bus and NEMA 1 indoor enclosure for longer endurance. It measures 58-Inch x 20-Inch x 6-Inch. 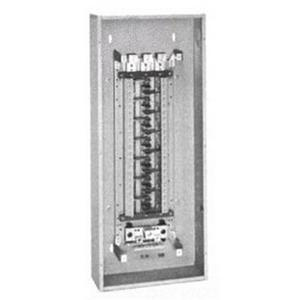 This 42-Circuit loadcenter incorporating 4-Wire wiring configuration, is suitable for service entrance applications. It features split neutral type. Main breaker loadcenter is UL listed.